Video: What Is A Cold Plate & How Does It Work ? 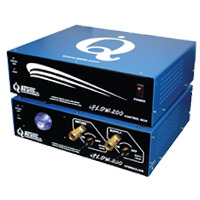 The iFLOW-200™ system measures the thermal and hydraulic characteristics of a cold plate. It replaces the complex process of varying the volumetric flow rate of the coolant, and measuring the pressure drop and temperature of the cold plate. iFLOW-200™ users simply set up the starting flow, ending flow, number of test points, dwell time, power applied to the cold plate and other parameters in the coolingVIEW™ software and run the application. The iFLOW-200™ measures a cold plate’s inlet/outlet fluid temperature, surface temperature, coolant volumetric flow rate and pressure drop by providing different flow rates to the cold plate. It measures coolant temperature from 0-70ºC with accuracy of +/-1ºC, using K-type thermocouples. Distilled water is used as the reference coolant. The system measures cold plate differential pressure up to 103,000 Pa (15 psi) with pressure measurement of +/-1% of full scale. The iFLOW-200™ features a separate control box and hydraulics units with USB connections. The iFLOW-200™ includes user-friendly coolingVIEW™ application software that automates the testing of a cold plate by setting the required parameters. coolingVIEW calculates thermal resistance and pressure drop of the cold plate as a function of flow rate for selected liquids other than distilled water.